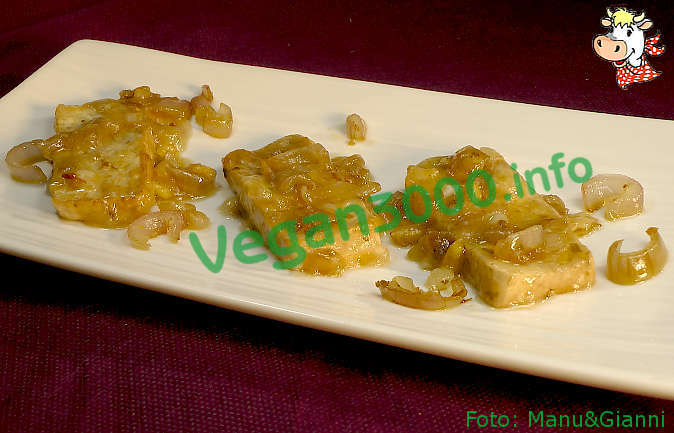 Cut the tofu into slices approximately 1 cm thick. Grate the ginger and sliced onion. Heat the oil in the wok and sauté the onion with ginger. Add the tofu and let it Brown on both sides. Add the soy sauce and mix thoroughly, then pour the hot vegetable broth and bring to a boil. Meanwhile, melt 2 tablespoons of cornflour in a little water and add to tofu to tie everything together. Carefully stir and leave on the heat until it forms a thick sauce and flavorful. Served with Basmati rice.